Has Eskom messed up on the bonus issue? The power utility’s cost for bonus payments almost doubled to R4.2bn last year. 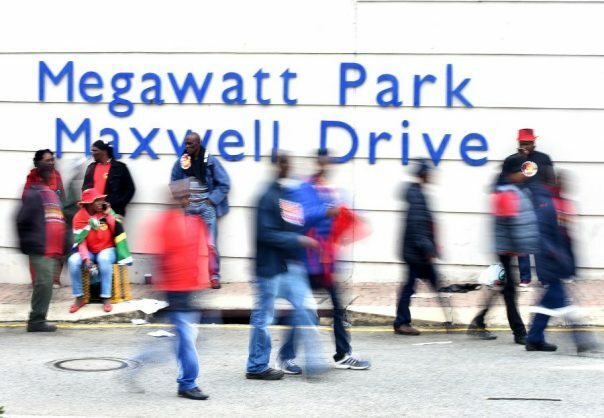 Trade unions representing Eskom workers are accusing the power utility’s new management of moving the goalposts for members of its bargaining unit when it comes to earning bonuses. According to National Union of Mineworkers (NUM) spokesperson Livhuwani Mammburu, the power utility has inserted two additional requirements that its staff must meet in order to qualify for bonuses, despite having agreed in writing to the rules of the game about a year ago. But how does Eskom determine whether its staff gets bonuses? Moneyweb has seen a presentation Eskom made to unions in May last year that formed the basis of the agreement about the 2017/18 bonuses. According to this document, the primary driver that determines the amount of money in the bonus pool is the group’s earnings before interest, tax, depreciation and amortisation (Ebitda). 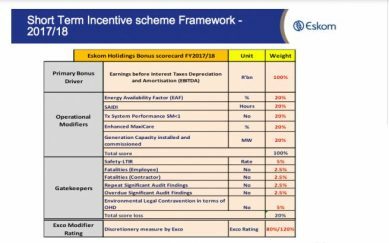 Johan Fernandes, Solidarity full-time shop steward at Eskom, told Moneyweb that the minimum requirement for getting any bonuses was an Ebitda of R41.29 billion. Beyond that, a sliding scale applies. Eskom reported R45.3 billion Ebitda, which according to the unions exceeds the minimum target and means bonuses should be on the table. There are five operational modifiers, each with a weight of 20%, which could see the different Eskom divisions – generation, transmission and distribution – getting more or less of the cake. These include the energy availability factor (EAF), which reflects the availability of generating units; the System Average Interruption Duration Index (SAIDI), which relates to distribution performance measured in hours; the performance of the transmission network; generation capacity installed and commissioned; and customer satisfaction measured by the MaxiCare system. Failing to meet one of these targets would reduce that division’s bonus pool by 20%. The specific targets of each of these modifiers aren’t known, but Fernandes says staff collectively scored 124.8%, which is far above the previous best of 110%. A further set of gatekeepers – relating to issues such as safety, significant or repeat audit findings and environmental non-compliance – could collectively only have a 20% impact on the total bonus award. Lastly, the Eskom executive committee has the discretion to increase or decrease the bonus pool by 20%. Individually, their impact could vary between 2.5% and 5%. According to Fernandes, these are the rules that the unions, Solidarity, NUM and the National Union of Metalworkers (Numsa) agreed to with Eskom. In April this year, however, the new Eskom leadership asked for a meeting with unions about the bonus regime. In documents sent to the unions prior to the meeting, Eskom added two additional requirements to the primary bonus driver. These were an 80% achievement of the shareholder compact – the agreement between Eskom and government about what Eskom should achieve – and an unqualified audit for the reporting period. Neither of these requirements were met in the reporting period, which has prompted Eskom to refuse to pay its staff any bonuses. The unions, however, do not recognise the addition of these two requirements to the primary drivers and are adamant that their members are entitled to bonuses. They say members have little control over the achievement or not of these two requirements, and that they never agreed to them. Fernandes says Solidarity members have given the union a mandate to sign Eskom’s offer of a 7.5% wage increase this year, and 7% in the two following years, with no housing allowance and no bonus. The union nevertheless feels its members are entitled to the bonus. Eskom needs the agreement of two of the three unions to implement the wage agreement, but NUM and Numsa have dug their heels in. This resulted in the threat of load shedding countrywide due to alleged intimidation and interference by union members. Last year, Eskom’s cost for bonus payments almost doubled to R4.2 billion, which pushed the utility into a loss on a stand-alone basis. On average, each Eskom worker received a bonus of R88 000, despite the fact that the power giant received a qualified audit report. Eskom did not respond to questions from Moneyweb about the bonus issue.